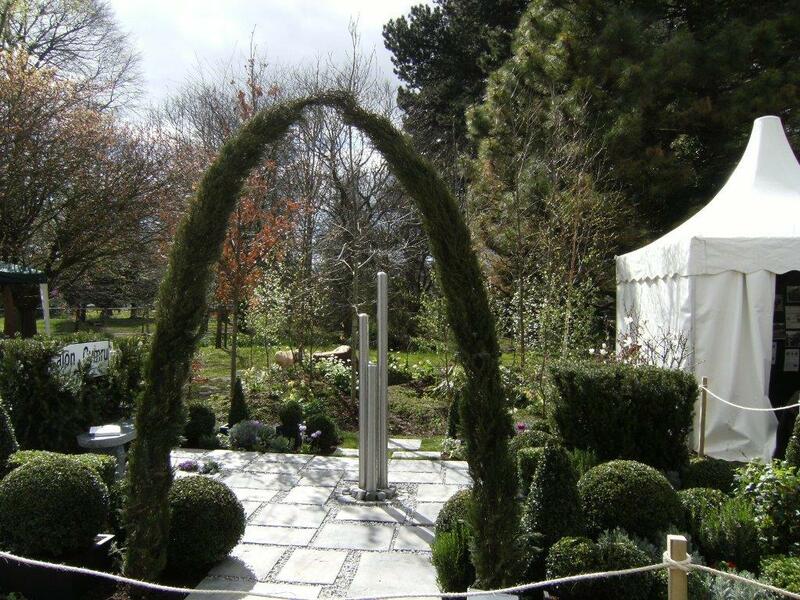 The RHS Cardiff Show in Bute Park in the centre of Cardiff is a small but prestigious fixture in the gardening calendar coinciding this year with National Gardening Week (15th to 19th April). Visitors are usually rewarded with fine weather and this year was no exception. On entering the show on the first day last Friday one was greeted by a much improved show entrance area both in terms of shelter and appearance. This year the Schools' Wheelbarrow Competition had been relocated to the Entrance Area giving it a very welcoming feel. Storytelling and craft activities for children were set against the backdrop of the vista of Cardiff Castle and surrounding parkland with magnolias and many other trees in blossom. The RHS is very keen to encourage children to become involved in gardening. As ever there were many interesting stands both of a garden related and craft/local food nature. The RHS stand looked very professional with staff ready to assist with any enquiries - especially informative were the many leaflets of gardens across the country which one would not normally come across. The two large flower marquees were packed with flower and plant displays of the highest quality. 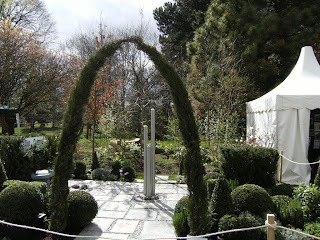 There were several show gardens on display exploring new and innovative ways of getting the gardening message across to the public - this one (pictured) was our favourite. Also featured was "Back to Basics", a new educational feature designed to develop skills which were demonstrated by Bridgend College students. 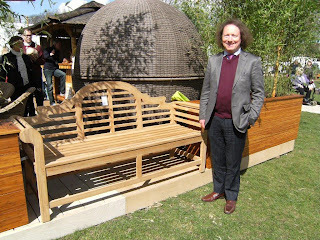 There appeared to be more trade stands in general which suggested that the garden buying public are considering making the most of their garden with some well chosen new buildings or furniture that they can enjoy however the summer of 2013 turns out. Towards the end of the day visitors were starting to make their way home pulling trolleys laden with lovely plants that they had purchased in the "Plant Village" where they had gained inspiration for new planting schemes in their own gardens. The whole ambiance of the day was enhanced by sunshine, warmth and very good live music from the bandstand which encouraged people to linger. Let's hope that the Malvern Show next month will be equally satisfying experience. 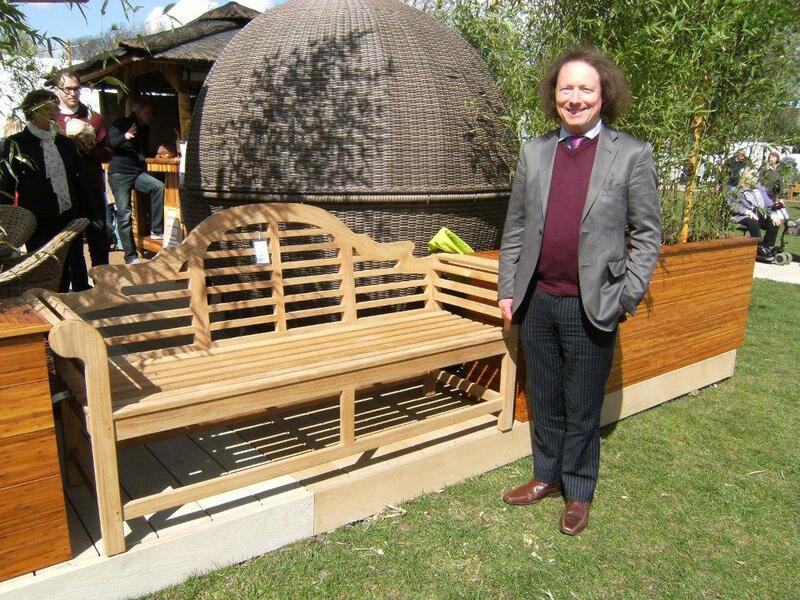 Heritage Director, Gilbert Stedham , beside a beautiful Lutyens bench at the Show. Visit https://itunes.apple.com/app/intogardens/id543857092 to download the latest intoGardens spring episode to enter our joint competition to win one for even less - free!